Sterling Publishing (NY), 9781454922902, 168pp. Too often, Jewish cookbooks still feature many recipes that lack whole grains and include too much salt, fat, sugar, and processed foods. But Paula Shoyer's delicious take on Jewish cooking is different: she uses only natural ingredients and offers a fresh, nutrient-dense spin on every dish. Here you'll find very little frying, and no margarine, frozen puff pastry, soup stocks and powders, and most jarred sauces. More than 60 recipes recipes include both Sephardic and Ashkenazy Jewish classics (Israeli Herb and Almond Salad, Sourdough Challah, Tzimmes Puree, Potato and Scallion Latkes, Schnitzel with Nut Crust) as well as American and international dishes that extend beyond the Jewish culinary world. In Shoyer's words: "This book has food you'll recognize, because you still want to feel connected to your ancestors' kitchens, but I've made it more nutritious and often easier to make." Arroz con Pollo with Brown Rice and Salsa Verde * Korean Bibimbap with Tofu * Bouillabaisse * Cambodian Spring Rolls with Lime Chili and Peanut Dipping Sauce * Feijoada (Brazilian Cholent with Collard Greens and Farofa) * Fish Tacos with Cilantro Lime Rice * Indian Barbecue Chicken * Japanese Lamb Chops * Vietnamese Chicken Noodle Soup * and much more. Paula Shoyer is a graduate of the Ritz Escoffier pastry program in Paris and teaches French and Jewish baking classes in the Washington, DC, area. She conducts large-scale baking demonstrations across the United States and Canada. Paula is the author of The New Passover Menu (Sterling Epicure), The Holiday Kosher Baker (Sterling Epicure), and The Kosher Baker (Brandeis) and is a contributing editor to kosherscoop.com, as well Joy of Kosher with Jamie Geller, Whisk, and Hadassah. 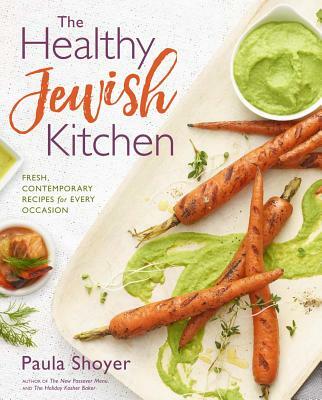 Shoyer has appeared on major TV cooking shows, is a frequent TV news guest, and edited the popular cookbooks Kosher by Design Entertains and Kosher by Design Kids in the Kitchen (both from Mesorah Publications). Shoyer lives in Chevy Chase, MD, with her husband and four children. To learn more about Paula Shoyer visit thekosherbaker.com.